A high commitment to comfort, a detailed devotion to design and performance, make Grand Monarch Ghia a fine small luxury car! Considerable power features, from power steering to power windows, and rich appointments combine luxury and convenience with a sensible, precision size. Of course, the smooth, quiet ride was designed by Mercury, the ride specialists. Interior luxury is elegantly understated. Precisely tailored European style bucket seats present soft grain leather or velour seating surfaces. A digital clock and luxury steering wheel are standard appointments, as are deep pile carpeting. 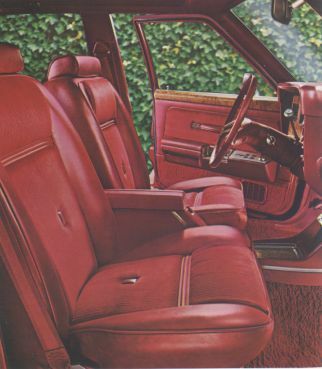 Grand Monarch Ghia standard bucket seats are shown below in dark red velour. Leather seating surfaces are available in dark red or two-tone saddle and white. Grand Monarch Ghia is one of the few American luxury models offering four-wheel disc brakes with a sophisticated hydraulic power system as standard. 1976 Grand Monarch Ghia - for discriminating owners wishing the utmost luxury in a precision size car. 250-1V "Six" engine - 3-speed manual transmission - Power four-wheel disc brakes - Solid-state ignition - Power windows - Power steering - Dome/Dual map reading lamp - Luxury steering wheel - Contoured bucket seats with leather or velour seating surfaces - Cast aluminum spoked wheels - Fully padded Normande grain vinyl roof - High level ventilation - WSW steel-belted radial tires - Deluxe sound insulation and ride package - Dual note horn - Digital clock - Deep cut-pile carpeting - Day/night interior mirror - Deluxe color-keyed seat belts - Carpeted luggage compartment - Ford Motor Company Lifeguard Design Safety Features - Note: Other equipment shown is optional. Within the photo album below are the 1975 and 1976 Grand Monarch Ghias which have been identified and registered. These rare beauties also appear on the main 1975 and 1976 Monarch pages.